BMW X5 is a third generation car available through our car rental services in Bucharest and Otopeni. As a SAV (Sports Activity Vehicle), BMW X5 exceeds all expectations, offering remarkable luxury conditions and being appropriate for any high-demanding situations. Its advanced technology and intelligent design take driving experience to a whole new level, on-road and off-road. BMW X5 is an SUV car that has an elegant design with aggressive notes, offering comfort, safety, and extra space in the trunk, even for big luggage. 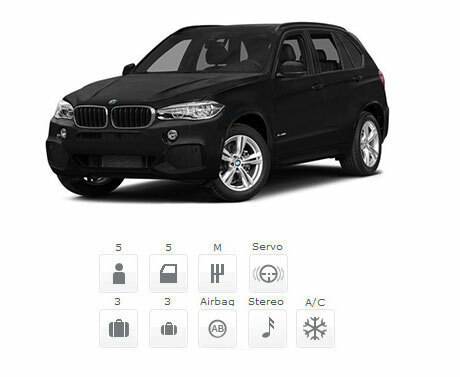 Available through our car rental services, BMW X5 is ideal for business meetings or vacation trips. Among its features, we mention air conditioning, autopilot, leather seats, navigation, trapdoor, airbags, ABS and ESP system. Driving a BMW X5 is an impressive experience, thanks to its intelligent hybrid propulsion system. In addition, the eDrive button located on its central console allows fine adjustments on the operation mode of the hybrid system. No matter the occasion, if you need an efficient car with low fuel consumption, choose FocusRent and its car rental services to get behind the wheel of a BMW X5! We offer you a full gas tank, RCA and full CASCO insurances included, and no kilometers limit!